Dementia is a progressive, incurable disease of the brain that causes progressive deterioration in thinking, memory and everyday abilities. 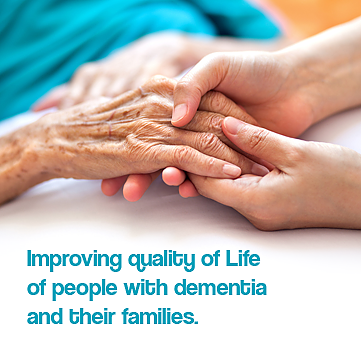 Dementia has been recognized as the cause of disability in 5% to 10% of the world population aged over 60 years. About 3.2 million people in India are affected by Alzheimer's and other forms of dementia. Alzheimer's disease and stroke are the two most common causes of dementia in India. ARDSI Hyderabad Deccan, based in Hyderabad, is a local chapter of the national office of the Alzheimer's and Related Disorders Society of India - a national, secular, non-profit, voluntary organization dedicated to improve the quality of life of people with dementia and families. What a joy it was to visit this centre. It was immediately clear that there was a much needed level of love, care and support being provided for people with dementia and their carers .People were warmly welcomed and given attention that met their individual needs. It was clear that the staff understood the importance of not stressing the person with dementia but to 'go with the flow,' this meant that the atmosphere was one of calm and acceptance. People were supported by the caring and knowledgeable staff to engage in meaningful activities that were interesting and stimulating but not taxing for people at different stages of the condition. Some chair exercises provided not only the opportunity to be active but also some laughter as well. There was also a wonderful singing together session. I was able to join in the singing, having been provided with song sheets in Hindi (a new and memorable experience for me). The joy and sense of belonging that this provided for everyone was obvious and a pleasure to be part of. The sharing of food and the opportunity to help people to eat was a great way to support people who, because of their condition, often have problems with eating. As with all activities attention was paid to each person's ability and needs. The staff, here, were also keenly aware of the needs of carers. There was an appreciation of the toll that caring for a loved one can take and the staff gave carers an opportunity to talk and seek support from staff and each other. A brief respite from the responsibilities of constantly caring was provided and carers were given an opportunity to relax a bit. The activities are provided in a building that requires staff to constantly overcome the limitations of space. Whilst they did this with apparent ease it would be wonderful if a larger premise could be found and so more people could benefit from all that this organisation has to offer. It is, indeed, a little oasis for people with dementia and their carers.